qaradhawi kata dalam al-halal wa al-haram fi al-islam, "Tidak boleh dikatakan sesuatu itu haram kecuali wujud nas yang sahih subut dan sareh dilalah dalam menyatakan pengharamannya. adapun lemah subutnya, atau sahih subutnya, tetapi tidak sareh pengharamannya, maka hendaklah dikekalkan kepada hukum harus"
DON'T WAIT IF U WANNA B A PIONEER! Asia MonaVie founder member, Mr. Johnny Chia from Sarawak will be in SS14 Subang Jaya at 8pm tonite to share his secret on how he earns USD$7k++ a week in less than a year. To reserve a seat plz contact 0133024241. Bro dah berkubur ke thread ni? Tgk cam lama sgt xupdate. Dengar monavie nak masuk mesia? 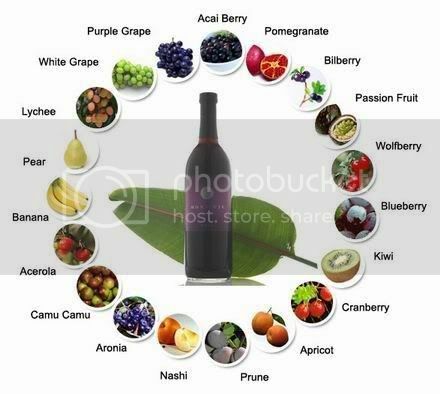 1) I think the Monavie fruit juice also play a very important role. This blend of 19 power-packed superfruits cured my serious backache in just 3 weeks time! And i dont have to sleep with my sleeping pill for 1 month already. This fruit juice is amazing! I can feel myself are healthy from within now..
2) My mum used to have serious neck and shoulder pain for many years..
She need to go for acupuncture every week. After taking it for 3 weeks, her problem totally solved! It’s a real amazing powerful fruit juice. 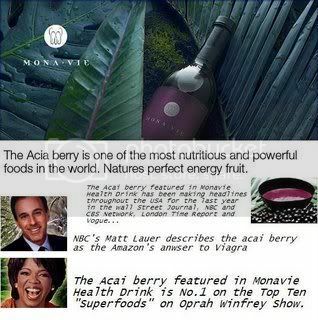 I have a friend study in US,she told me Monavie is the top health product in US, its famous . Btw,it convince me because i saw the testimonial video from youtube.com. 3) For the Monavie juice, initially have to drink 4 oz a day to treat a problem. 1 bottle will only last for a week. For treatment purpose,it needs at least 1 box to see good result. But you do have a very good sleep after drinking 2 oz each time. Its excellent for those who has sleeping problem due to stress..
Its a very healthy organic power pack fruit juice. Its a wonderful superfood for anti-aging purpose. after consuming this juice for 2 years ! Its better than eye cream! Leader ni dulu yg BOOMkan jus manggis di mesia. downline dia dkt 10000 org kt sana!!Fuyyooh!! Plan dia binary ngan matching bonus!! leh wat duit besor!! Jadilah yg terawal! !